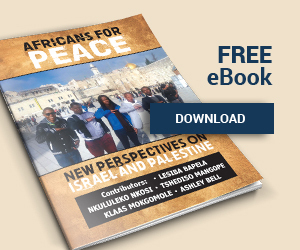 As a black South African and member of the ANC, I have often heard the accusation that Israel is an apartheid state – and therefore a just solution has to be based on a single state of Palestine, between the Mediterranean Sea and the Jordan River. So I recently made a trip to Israel and the West Bank in order to understand the issues and the prospects for resolving the conflict. Traveling through the country encouraged me to reflect upon the suggestions by some sections of the Palestine solidarity movement, particularly those advocating for BDS, that it is possible to establish one country between Israel and Palestine based on a “one-state” solution, like the one we established here in South Africa. Though supporters of this solution claim it is democratic, the rejection of a Jewish State is in fact a modern way of institutionalizing antisemitic posturing. First and foremost, my visit to the region confirmed for me that there is no meaningful comparison between the State of Israel and the former apartheid regime in South Africa. I grew up under apartheid. I saw my parents being humiliated under apartheid. The scars of apartheid still live with us to this day and are strongly embedded in the psychology of my people. Therefore, in considering what a just solution to the Israeli-Palestinian conflict involves, I reject both the analysis that Israel practices apartheid and the demand that Israel should be dismantled and replaced with a single state of Palestine. I grew up during an era in South Africa when there was structured, state-imposed organization of black lives. The apartheid regime created conditions that were exclusive to black people. Colonialism and apartheid had deliberately made poverty, bad education, landlessness, and cheap labor part of what it meant to be black. Under apartheid, our legal status was that of an inferior people. I recall witnessing the humiliation of my parents and watching the persecution of our political leaders on the news. It became hard for me to continue having conversations without actually doing some- thing. So I joined the liberation movement, the African National Congress (ANC), to end the humiliation of our parents and the suffering of black children. I was elected chairperson of the Young Communist League, the youth wing of the influential South African Communist Party (SACP). Upon entering law school at the University of Witwatersrand, I was elected to the South African Students Congress (SASCO), and as branch chairperson of the ANC Youth League. The oppression and mass murder of Jewish people did not only take place in Nazi Germany, as many people falsely believe, but in many parts of the world, wherever Jews sought to live among other nationalities. From the time of the Seleucid Empire, when all cultural and religious practices of Jewish people were banned by law without cause; to the persecution at the hands of Christians, who were taught by the Church that Jews were collectively responsible for the murder of Jesus; and from the massacres of more than four thousand Jews in Granada during the tenth century; to the mass murder of about six thousand Jews in Morocco around the same time, the suffering of Jewish people in many parts of the world is recorded fact. It is important to reflect on this history in order to understand the origin of this conflict. Not surprisingly, fervent critiques of Israel erase this history and focus all energies upon the conflict immediately before and after the declaration of a Jewish state in 1948. Those who butcher the history of Israel in this manner are themselves guilty of causing and perpetuating the conflict. They deliberately do this to conceal the truth, which to them is an inconvenience. Let’s start with the lessons we learned from the peaceful transition into a democratic, single state in South Africa following the CODESA (Convention for a Democratic South Africa) negotiations. Secondly, the oppressed black people in South Africa were the overwhelming majority and could, therefore, still mobilize them- selves even after suffering multiple defeats. We could also rely on the support of other neighboring African countries, which had gained independence before us and helped us to the democratic victory of 1994. Thirdly, the oppressed black majority of South Africa made it expressly clear that the content of our struggle was not to annihilate the white minority, who designed and were profiting from apartheid. The history of all black struggles in South Africa is the striving for peace and reconciliation. From the beginning of the twentieth century, all petitions and representations we made to Britain were rooted in the best traditions of peace and cooperation. We refused to kill white people, particularly women and children, who are the most vulnerable in society. We even declared in 1955, when the machinery of apartheid was at its most repressive, that “South Africa belongs to all who live in it, black and white.” In South Africa, the ANC’s armed wing, the Umkhonto we Sizwe, understood that the conventional rules of war prohibited the attack and killing of innocent civilians. Any transgression, intentional or otherwise, was punishable in the Umkhonto we Sizwe camps to prevent a recurrence. We sent a message to the world that, as blacks, we were fighting against an unjust system and that we were not engaged in a terrorist enterprise. However, the situation is different in Israel. Despite the fact that Jewish people have a legitimate claim to Jewish land, most Palestinians refuse to recognize Israel’s right to exist. They have essentially supported the call for the genocide of Jewish people – and, indeed, a single state between the Mediterranean and the Jordan River could only be achieved by killing and expelling the majority of Jews currently living there. The first concerns a young female entrepreneur, in her mid- twenties, who, by her own admission, has been working with Israeli companies to grow her businesses. Although she supported cooperation with Israeli businesses in order to boost the local economy, which is frowned upon by most of her people, she told us that she too was not prepared to live with Jews in one state. The suggestion that it is possible to establish one country, based on a one-state solution, is just not possible. Expecting people with a bitter history of persecution, like the Jewish people, to abandon the idea of a Jewish state, the only state that has guaranteed them freedom and security, is not only un- reasonable, but also unfair. thanks for this interesting article. I sincerely hope that there will be a time in the nearer future when Israelis and Palestinians can live in peace, and your article made me aware of the highly problematic side of the comparison between Israel and Apartheid South Africa. However, it also left me with some questions. As far as I know, the majority of the Jewish people does not live in Israel; the majority lives in other countries all around the world, especially in the US. Hence, it is problematic to equalize the Jewish people with Israel. Another point is the history of Israel. At the time when European Jews migrated to what was then British mandatory territory, Arabs lived there. In the following conflicts between the newly arriving Jews (who fled the increasing German antisemitism) and these Arabs, hundreds of thousands of the latter were expelled although they had lived there for centuries. Don’t you think that these are two important aspects to consider?